Do you step up or let them???? 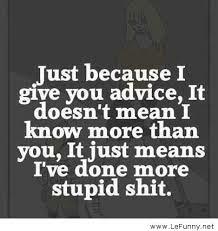 Do you offer advise, or let people continue with what they are doing??? This is something I am constantly confronted with. I am not about to start offering unsolicited advise to every person at the gym. However what do you do when you see someone who obviously is trying but is doing it all wrong? Do you step up and say “Can I help?” Or do you just let them go on? Case in point. This morning at the gym there was an older lady and her daughter working out. Neither is large, they were both trying. I generally keep my ear phones in my head down and do my thing. But I notice the Mom trying to tricep pull downs on a cable. She’s got way way too much weight, bad form and is not really doing herself a whole lot of good. First time I just ignored it, but when I saw her up the pin I started to worry she was going to hurt herself. So, I eventually took my ear phones out walked over and said “Sorry, but can I show you how to do that properly?” She was awesome and said “yes, of course… please” When I explained that if you are swinging you’re entire body as opposed to focusing on the muscle group you could hurt yoruself, showed her proper form, dropped the pin and had her do a set, she said “wow, that’s much better” I thought… ok. Right thing to do. Except she then explained to me that its what a “trainer” had told her. Now…. there’s a few things that coulda happened here. She did’nt understand what the trainer said. She did’nt really have a trainer tell her to do it so. Etc. There’s another kid at my gym. The first time I went in and he was working out. I watched him strut around the gym for 20 minutes. He loaded and unloaded weights, but really did nothing. He kept disappearing to the front of the gym (the place with no weights where nobody can see you, where they sign up new clients) he’s come back, strut some more. After 20 or 30 minutes he finally walked over in front of me, picked up 2 45 lb dumbbells and started full body swinging them behind himself and up to his shoulders. I’m sure this was his version of “curls”. I said nothing. This kid was eyeing me like “fack off” the whole time. He did one set of these, disappeared and then left immediately. The next time I saw him at the gym…. the second I walked in. He left. I don’t care about these guys. They will either figure it out, or they will hurt themselves and not be back. My mom has commented being a long time goodlife member that she wishes the trainers when not training a client would walk around and correct people doing things wrong. Do you think that when you see someone doing something dangerous or wrong, you should offer you’re advise, or do you let them carry on.????? Nothing wrong with offering advice, most reasonable people accept it when offered in an interested way. Those who fail to listen are usually the ones who end up injured. Poor form is the thing you see the most, usually coupled with far too much weight! And hey, trust all is going well for you, Baz! Oh that’s a slippery slope! I don’t have your credentials, but still feel like I have a lot more to offer than a lot of the ‘trainers’ at my gym. However, I’m happy to tell people what has worked for me personally. If they ask. If not, I leave them to their devices and hope a gym official might intervene to avert any crises. The problem that I mostly see in my neck of the woods is women lifting too little weight, and basically wasting their time. That’s a bit of an uphill battle, but I continue to fight it by modeling otherwise…and supporting other amazingly muscle-y moms (present company included) any chance I get! As a trainer I think you did the right thing, I wish more trainers would take your mom’s advice!